Perennial. Zone 2. 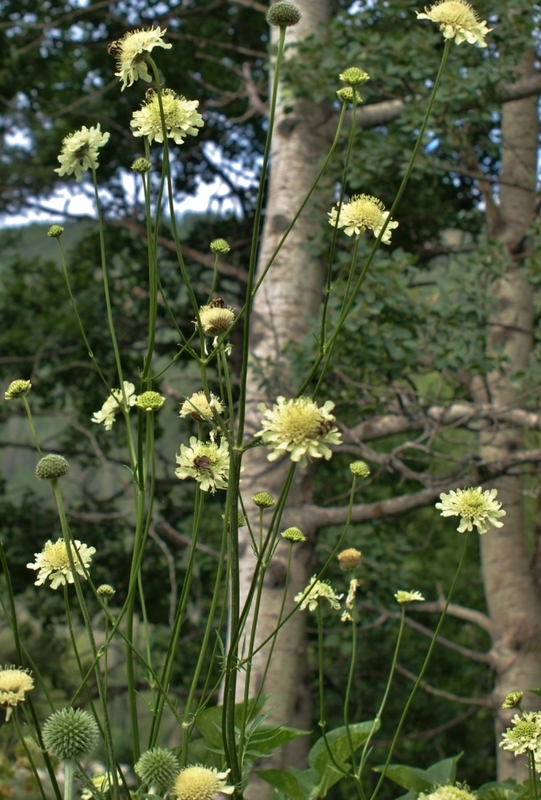 Asteraceae, formerly Compositae. East-Central Europe, Asia. The genus name is from the Greek echinos = “hedgehog-like” (in some references “sea-urchin-like”) – in reference to the spiky structure of the bloom; ritro = “of gardens”. This is often the first Globe Thistle every gardener starts out with – my original plant is alive and well and giving great pleasure more than twenty years after I received a hefty division of it, overflowing its disintegrating cardboard box, from a fellow-gardener friend. I’d admired her gorgeous dried flower bouquets containing the perfectly round, frosted blue Globe Thistles at an early autumn farmers’ market, and she remembered my interest the following spring. 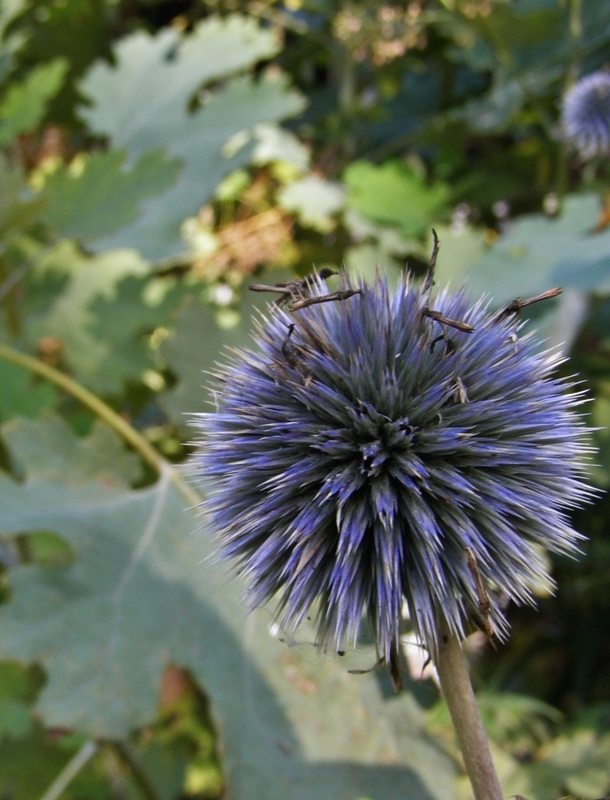 Though the common name “thistle” might cause the neophyte Echinops grower some initial concern, the prickles on this plant are soft and benign. The lush, dark green, raggedly-cut foliage is tipped with flexible points, but they do not detach, and the plant can be handled easily with bare hands. Echinops ritro is a clump former, with a height of 2 to 4 feet or so, depending on soil fertility and moisture, and a spread of about half its height. 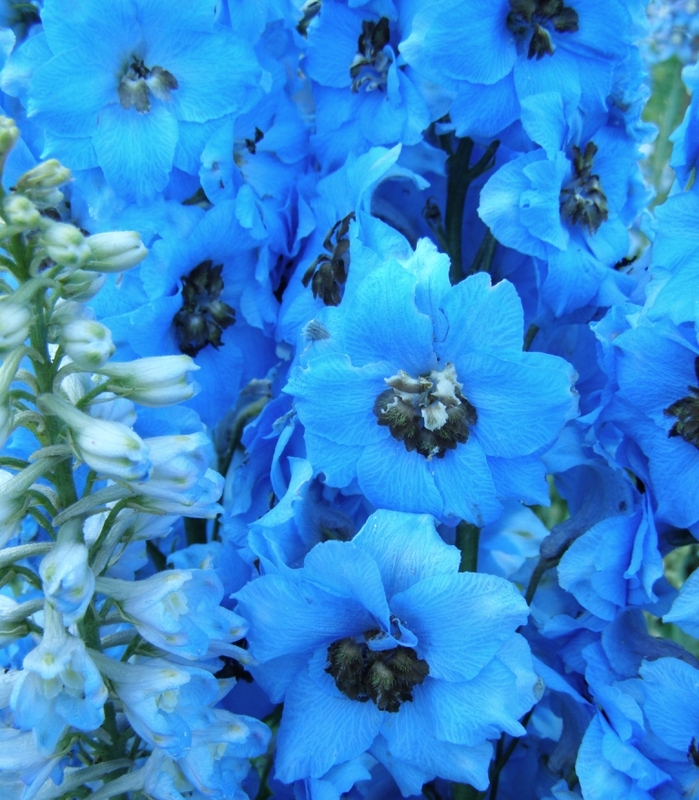 Sturdy stems covered by fine white hairs produce perfectly globular buds in mid-summer, and these enlarge and expand and take on an increasingly intense blue tint, until the tiny electric-blue flowers pop open one by one and immediately attract bees, butterflies, and a host of other nectar and pollen seeking visitors. Bloom time of the large golf ball-sized and -shaped flower clusters is extended, easily 6 to 8 weeks or more, and the aging flower heads stay attractive well into fall, when they will be visited by chickadees and other small birds which relish the seeds. Echinops ritro is hardy and drought tolerant, but produces the best show in good garden soil with summer moisture. It spreads modestly at the roots, expanding its clump year by year, and it will also self sow in a mild way. Plants are tap rooted, but mature clumps may be divided with care in early spring. Full sun to light shade is acceptable to this plant. 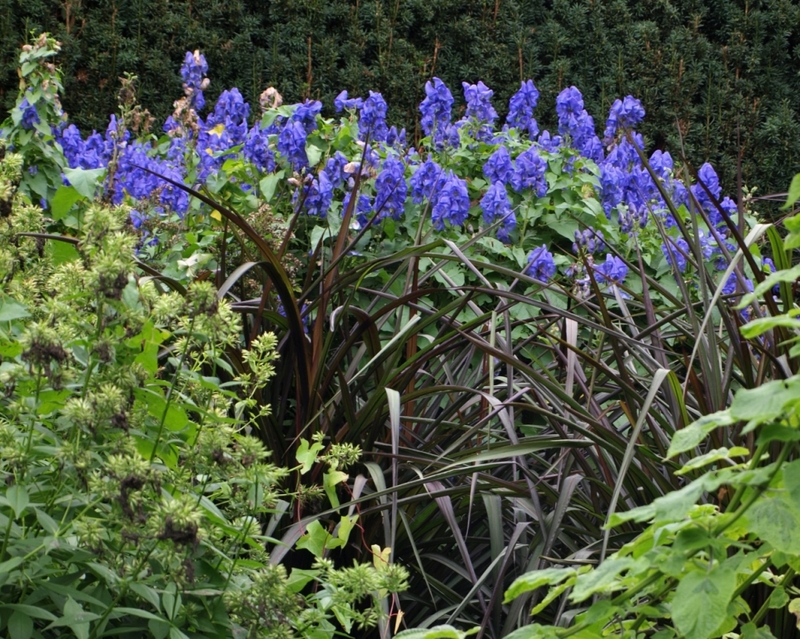 It combines beautifully with the other blue garden thistle, Eryngium planum (Blue Sea Holly), as well as fall-blooming sedums such as Hylotephium x ‘Autumn Joy’, any of the Rudbeckias, and all sorts of ornamental grasses. This is a very late bloomer; the photo here was taken in October of 2012. Many years the buds are frozen before it can bloom, so I’m not going to recommend it for Cariboo gardeners, unless you’re willing to put up with several years of disappointment to each lucky combination of circumstances which will give you bloom. But when it does bloom, it’s a lovely, unexpected thing! 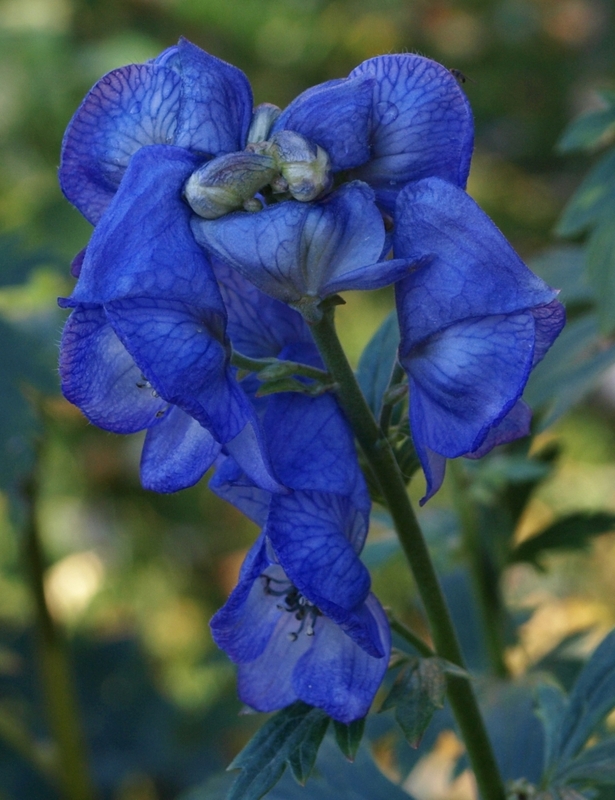 This is a tall Monkshood, with sturdy stems which can reach 6 feet. 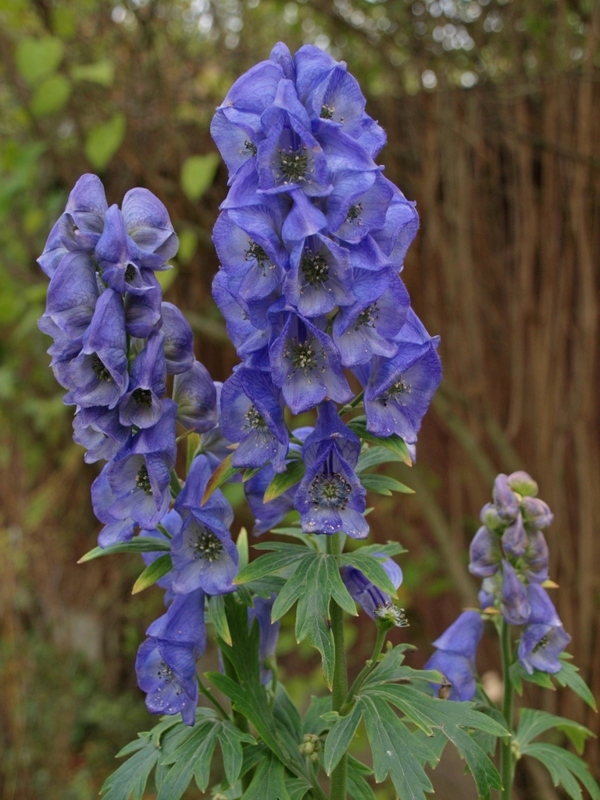 Buds are produced in August and take their time maturing and opening, but when and if they do they are classic monkshood cowls; smoky, dusky blue with green veining and sooty black stamens. The flower spikes are densely crowded, occasionally branched. Very handsome, dark green, deeply cut foliage in healthy, ever-increasing clumps. Site at the back of the border, with extra moisture during the dry times, and light shade if possible. Then cross your fingers! This is another one you won’t often find for sale; we won’t be offering it this year either, but may one day in the future. Our own cherished clump is coming along nicely, but we are hesitant to disturb it until it gets a little larger and we can steal some pieces off the edges instead of digging the whole thing up. Note: All monkshoods are poisonous, in all of their parts. Handle with care. Perennial Herbaceous Vine. Zone 3. Fabaceae, formerly Leguminosae. Originally native to Southern Europe, now sometimes seen naturalized in disturbed-soil areas as a garden escapee throughout Europe, Great Britain, and parts of North America, including coastal British Columbia. 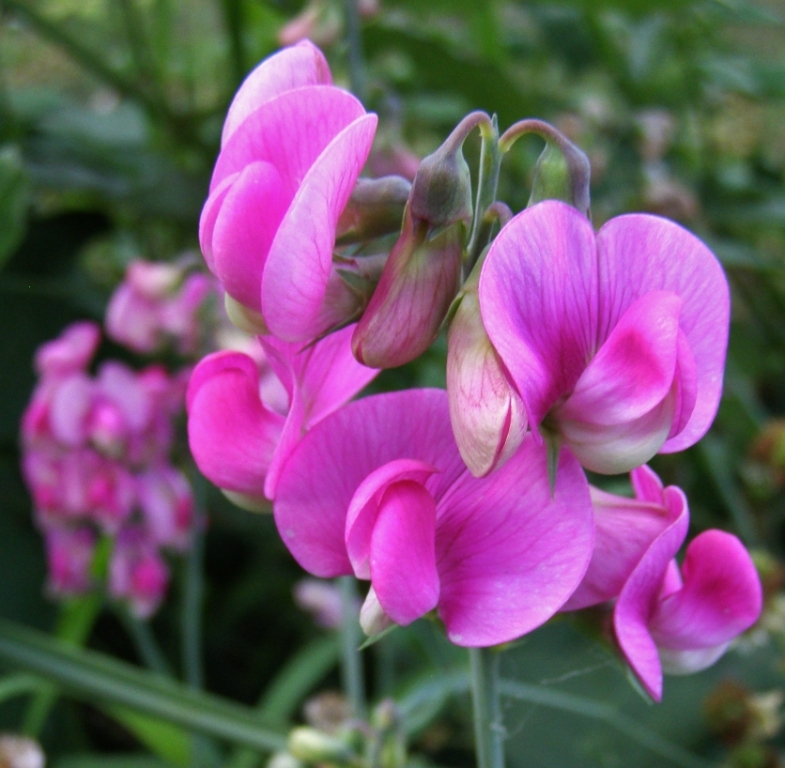 Lathyrus is from the Greek lathyros, pea; latifolius from the Latin latus + folium, wide + leaf. Clump former to 18 inches wide; sprawls or climbs 3 to 6 feet tall by twining tendrils in the leaf axils. Fine in average soil and moisture; prefers full sun. 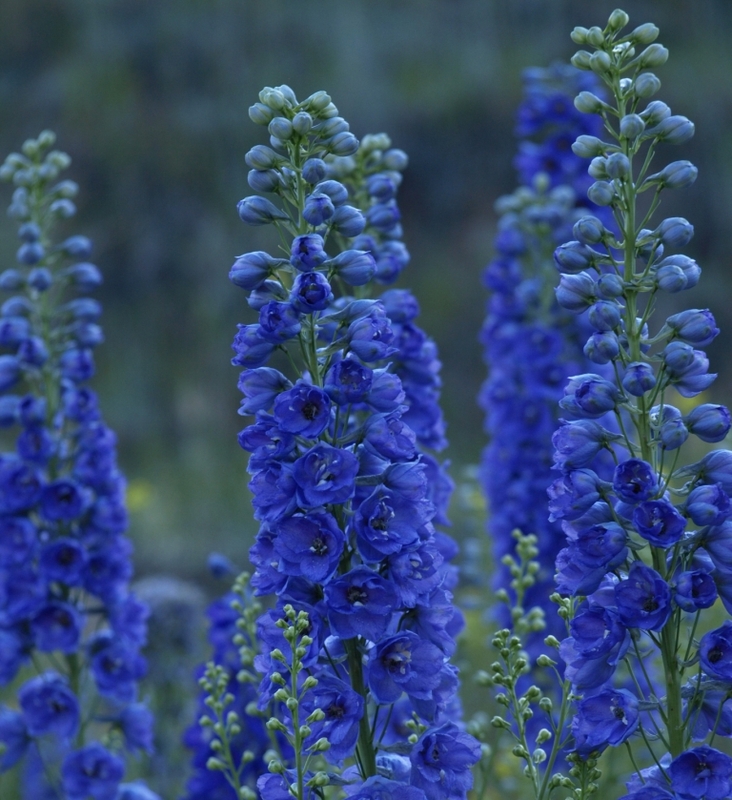 Established plants are reasonably drought tolerant, but thrives best with summer moisture and fertile soil. 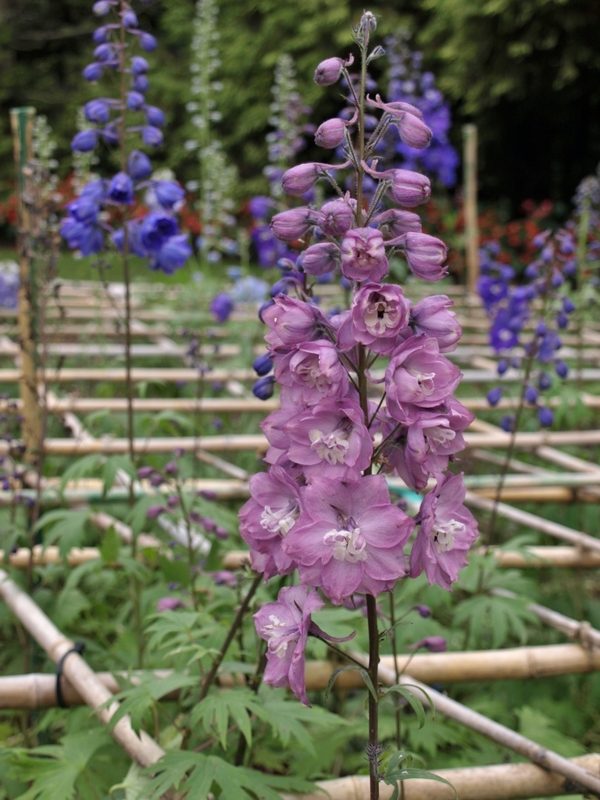 This pretty climber/sprawler is rather rare in Cariboo-Chilcotin gardens, but I have seen it thriving often enough here and there in Zone 3 and 4 Williams Lake and Quesnel area plantings to be able to confidently recommend its hardiness and adaptability. 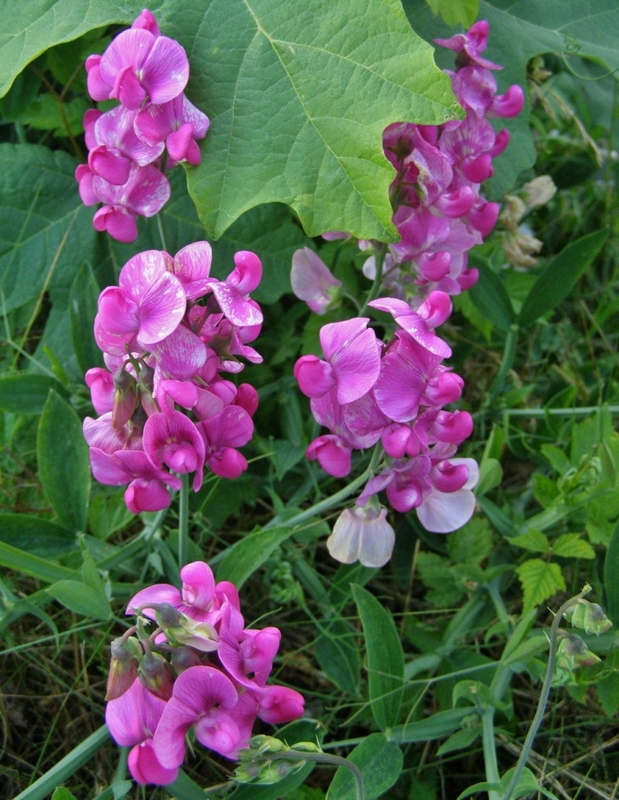 Sadly, the “sweet” reference is merely to its similar appearance to the highly fragrant annual sweet pea, Lathyrus odoratus, as Perennial Sweet Pea is not noticeably fragrant. Vines reach 3 to 6 feet long – tallest where it can climb, and where grown in moist, fertile soil – and either sprawl along the ground or twine their way up whatever support they can find. 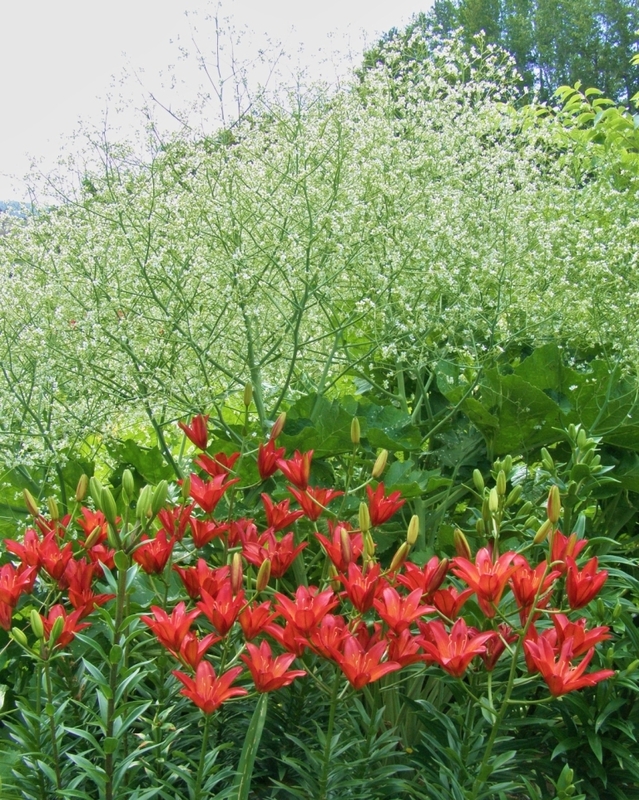 Very nice grown on a bank where it can cascade, or on a sturdy trellis or garden obelisk arrangement. Vines are completely herbaceous, and die back to the ground in the winter, to re-sprout in spring. Sometimes late to emerge, so keep an eye out for it when digging about in the spring garden. A very long-lived plant, which should be sited where it can remain as it does not transplant well. It may self sow, but though definitely a “survivor” where established, it is not aggressive and is not considered an invasive plant in our climate, though it is occasionally seen as a naturalized garden escapee in disturbed soil areas along coastal British Columbian roadsides where it has joined other exotics such as butterfly bush (Buddleja sp. ), touch-me-not (Impatiens sp. ), and the ubiquitous Himalayan Blackberries. Lathyrus latifolius has been grown as a prized garden flower for centuries throughout Europe and the British Isles, and in North American colonial plantings, and the pink strain appears in the 1801 species inventory of Thomas Jefferson’s famed Monticello garden. 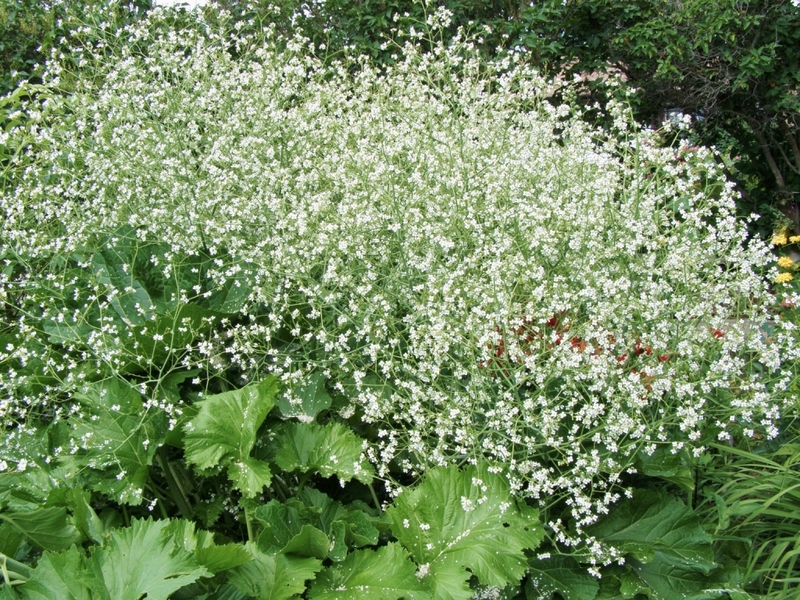 This plant often shows up on old herb garden lists, but no medicinal uses are recorded. 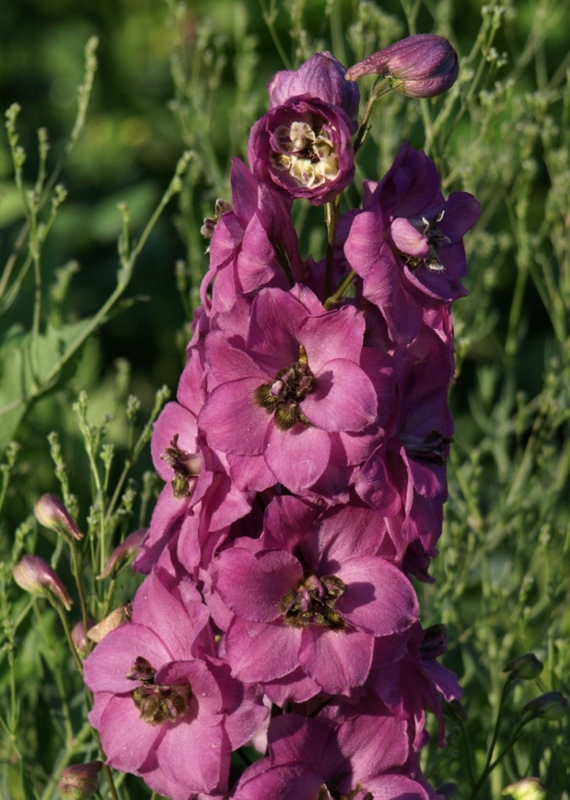 Apparently the foliage was occasionally used as a pot herb, and the seeds cooked and consumed for their high protein content, but present-day consumption is definitely NOT recommended, as the seeds of some of the species in the Lathyrus genus do contain potentially harmful amino aids. 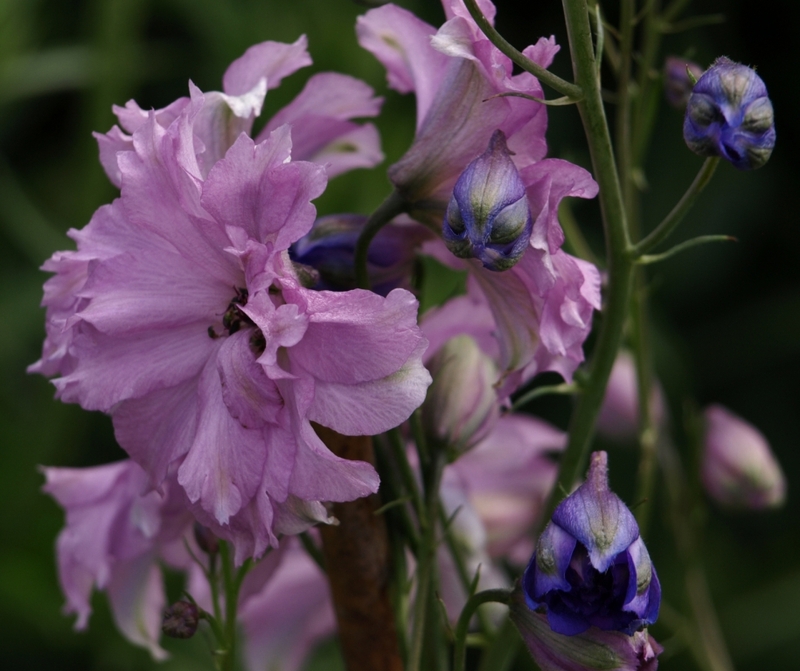 Best to enjoy it for its beauty alone, as most of our gardening predecessors did. Many species of bees and butterflies visit the flowers in search of nectar, as do occasional questing hummingbirds, but the floral structure is designed for pollination by bumblebees, as they alone are strong enough to part the keel petals which enclose the reproductive parts of the blooms. Three old-fashioned named strains are still available; all are very lovely. ‘RED PEARL’ – rich carmine pink. ‘ROSE PEARL’ aka ‘PINK BEAUTY’ – pale pink flushed darker at petal edges. ‘WHITE PEARL’ – pristine snow white. Biennial. Zone 3. Scrophulariaceae. Europe, northern Africa. 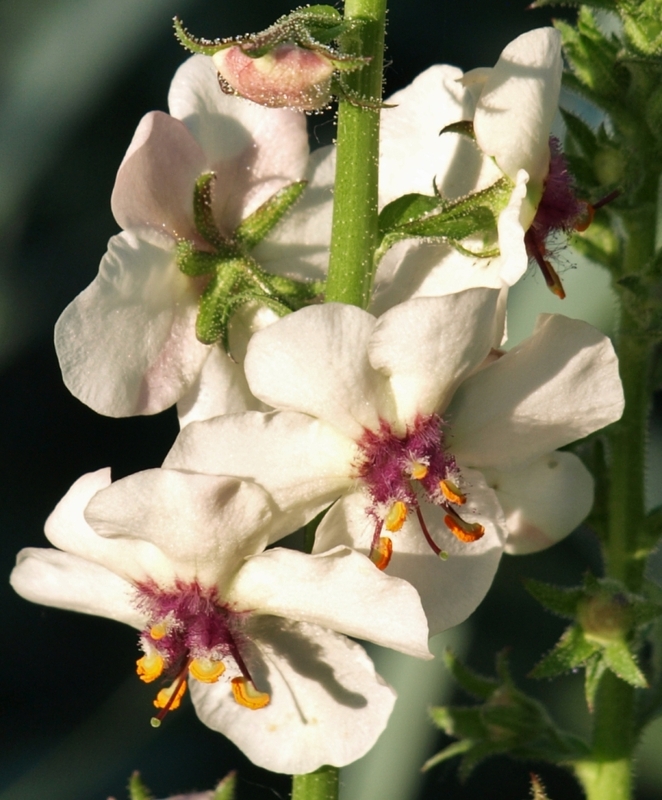 Verbascum is from the Latin barbascum, bearded. Blattaria comes from the Latin blatta, cockroach, in homage to the plant’s history as an insect repellant. Thrives in full sun to part shade. Happy in a wide variety of soils. Quite drought tolerant. A dainty and lovely biennial. In its first year, smooth, deep green leaf rosettes form and lie close to the ground, giving no hint of next year’s tall and graceful flower stalks. 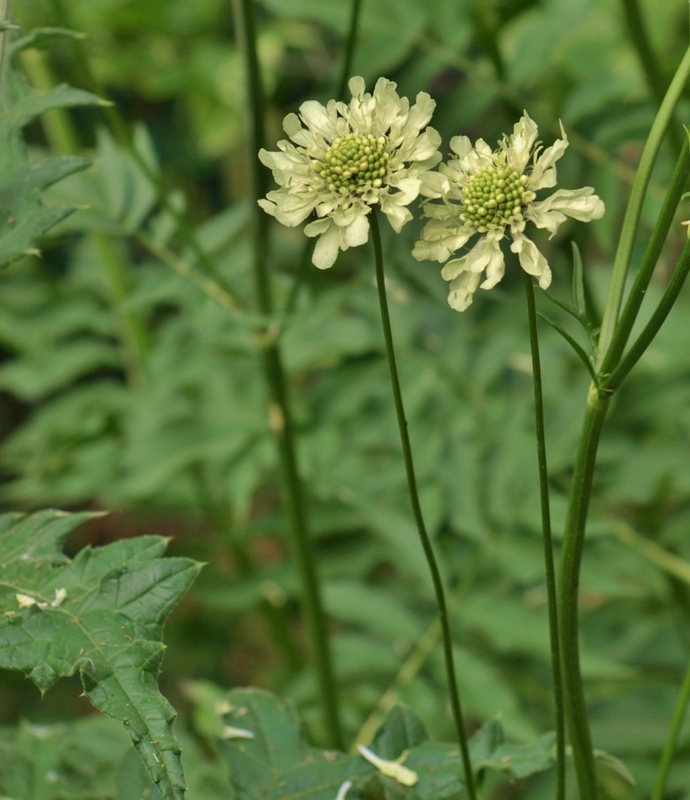 The rosettes overwinter and start to show signs of further development in the spring of the second year, when slender, multi-branched stems emerge and elongate, reaching an ultimate height of 4 feet or so for the white form, and up to 6 feet for the yellow. Though tall, Moth Mullein’s general effect is airy enough for the front of the border. Neatly folded, angular buds on short pedicels pop open into large, gleaming white flowers blushed on the petal backs with purple, echoing the bright purple, intricately furred stamens tipped with brilliant orange pollen. 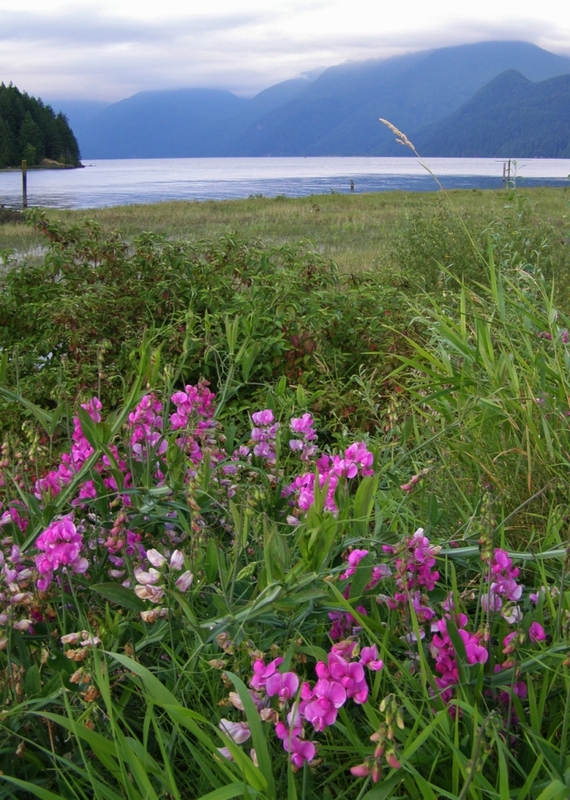 Blooms unfold in late June or early July, and continue through summer, ending at last in September. The common name of Moth Mullein is thought to come from the resemblance of the stamens to the intricately haired antennae of moths. 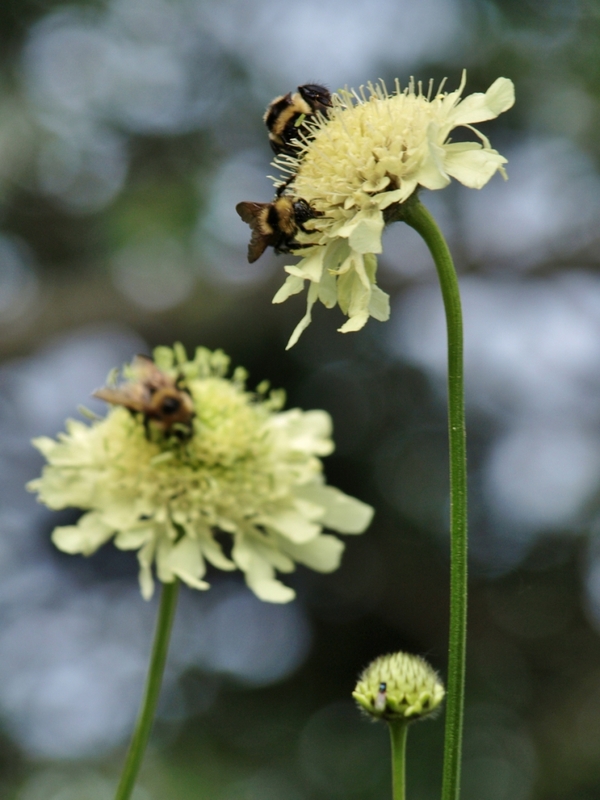 The flowers are also attractive to all sorts of insects, including nocturnal moths and early-foraging bees. 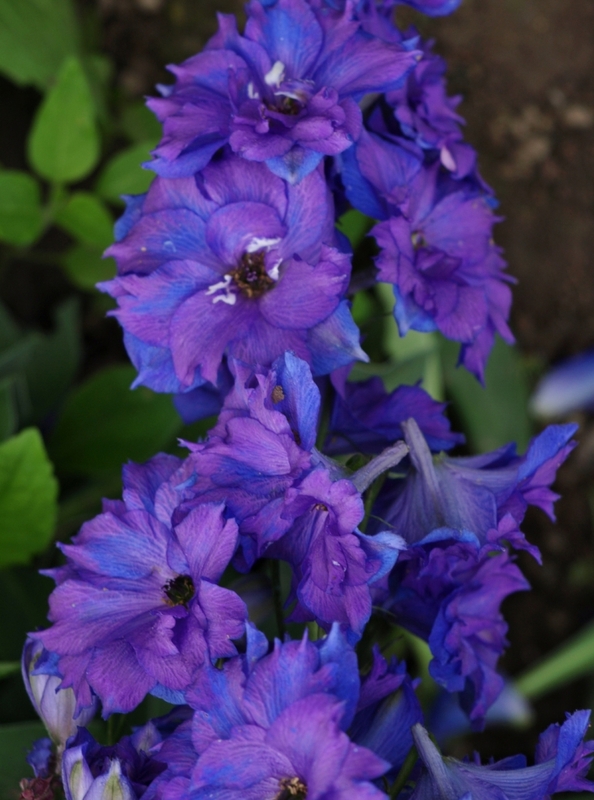 Blooms unfold in earliest morning, and subside by noon, to reopen the following day. Neatly dropped flowers are followed by hard, round seed pods, each containing hundreds of small, black seeds. 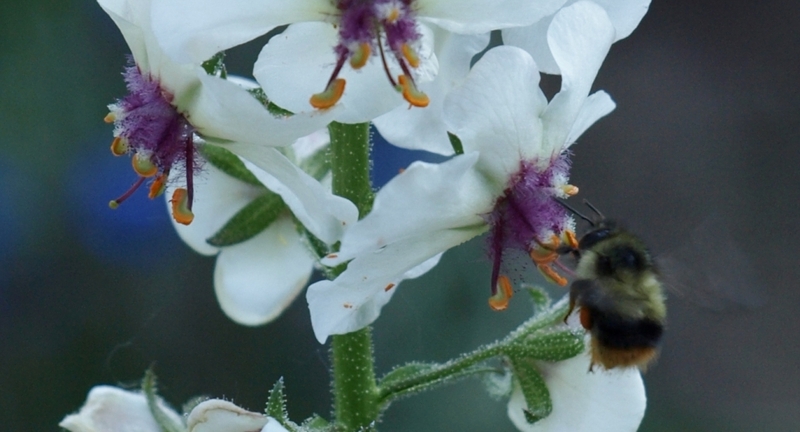 Seeds of this species remain viable in soil for a long time; in one well-documented experiment initiated by Michigan State University Professor William James Beal in 1879, Moth Mullein seeds sprouted over 120 years after their storage outdoors in an upside-down bottle buried in dry sand. Arriving with early European colonists, Moth Mullein has been known to grow in North America since at least the early 1800s. It has become naturalized to various degrees across the United States and into southern Canada, being particularly successful at establishing itself on freshly disturbed ground. Moth Mullein was traditionally used to safeguard fabrics against moths and other insects; American colonial gardens grew Moth Mullein for this purpose and also for use as a dye plant. With appropriate mordants Moth Mullein yields green and yellow dyes. 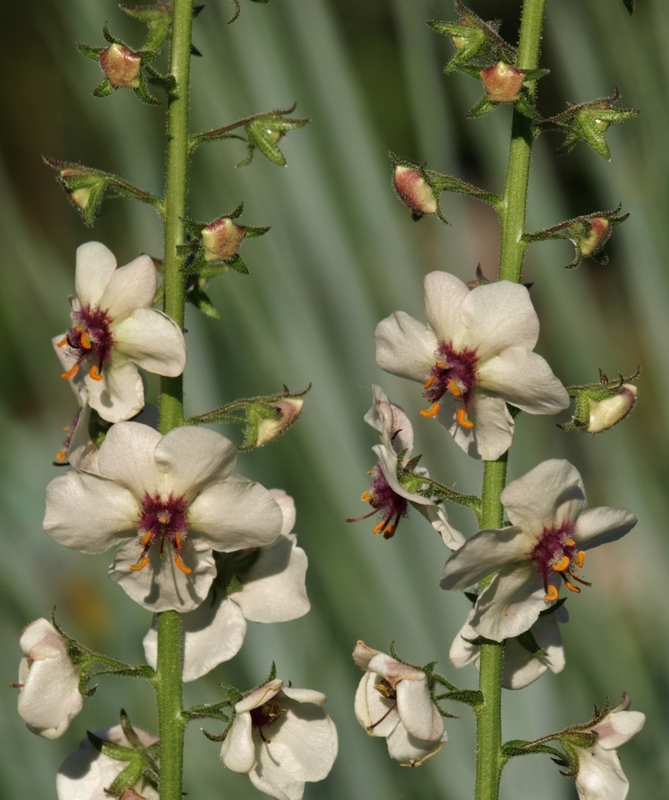 Verbascum blattaria has been investigated for various medicinal properties, and in 1974 was the subject of a study on its insecticidal properties, showing some intriguing possibilities as its application killed over half of the mosquito larvae in the study.